Researchers from The Australian National University (ANU) could be a step closer to saving the critically endangered swift parrot, after showing it's possible to predict where the parrots will settle to breed. Swift parrots are nomads that move to a new location to breed each year depending on where their preferred food, nectar from flowering trees, is most abundant. Because food availability fluctuates across Tasmania, the movements of the parrots have been difficult to predict. This limits the ability of conservationists to protect the species. The Difficult Bird Research Group have found that by assessing flower bud development in food trees, it is possible to predict where swift parrots will settle to breed up to a year ahead of time. "This is a game-changer for swift parrots because, until now, managing swift parrots has been very difficult, especially in terms of protecting their habitat from deforestation," lead author of the study Dr. Dejan Stojanovic said. 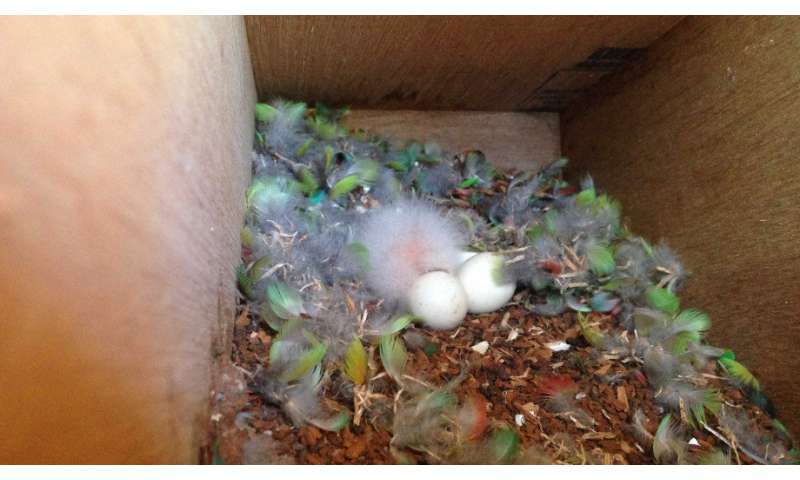 "Being able to predict where swift parrots would settle enabled us to deploy nest boxes ahead of the breeding season and so increase the availability of nesting sites." The study found providing nest boxes allowed more parrots to breed at preferred sites, despite a shortage of natural nests. "Accurately predicting where birds will settle allows managers to implement proactive management actions at important sites," Dr. Stojanovic said. "This contrasts against the reactive approaches currently in place for managing swift parrot habitat." Over the last 20 years, one quarter of remaining swift parrot habitat has been logged in the Southern Forests of Tasmania, which are an important breeding area. The scientists are concerned that without better protection of swift parrot habitat, other conservation interventions like nest boxes may not be enough to prevent the species from going extinct. 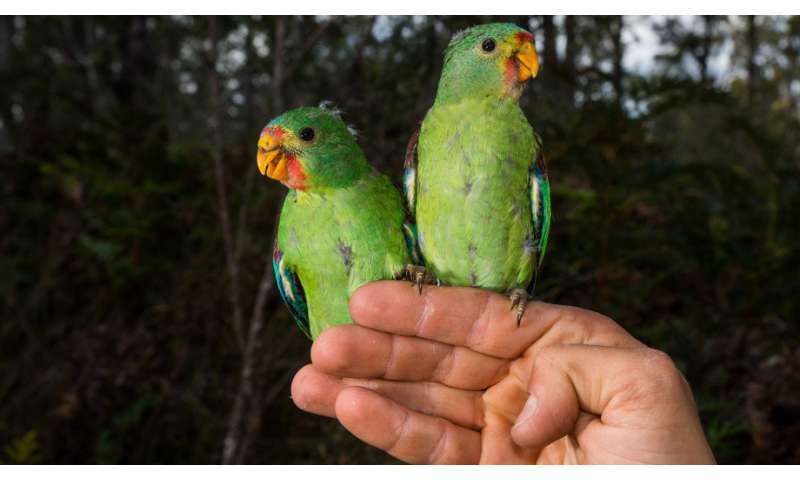 "Although it's great that nest boxes can be used to augment habitat availability at important sites where swift parrots will breed, if we are serious about preventing this species from going extinct, then we need to stop logging its remaining habitat," Dr. Stojanovic said. The nest boxes were paid for by 1,156 people who contributed to a crowdfunding campaign "Parrots, the pardalote and the possum' launched by the team in 2015. The researchers also received funding from the National Environmental Science Program. The Difficult Bird Research Group has crowdfunded four projects, including a recently successful bid to train a detector dog to locate endangered owls in Tasmanian forests. More information about their work can be found at www.difficultbirds.com. The research has just been published in The Journal of Wildlife Management.